This 1931 photograph was taken not at one of the Hopi mesas but at the Grand Canyon, where Einstein and his wife had stopped briefly during a train ride back from Pasadena, where Cal Tech was attempting to persuade him to join the faculty. There are several odd things about this photo. Einstein, holding the hand of an uninterested Hopi child, looks comfortable, while his wife, shrouded in a black shawl, does not. The feathered headdress and the pipe given to Einstein are not part of Hopi regalia but belong to Plains Indian tribes. And Einstein may have known that his visit to Cal Tech caused embarrassment because of his openly expressed pacifist views; the university was soliciting funds from conservative sources and certainly had no interest in promoting the cause of peace. The background of the photo, Hopi House, is part of the Grand Canyon El Tovar hotel, designed by Mary Colter. Many tourists photos have been snapped there over the years, and probably the friends and relatives who saw them later assumed they were taken at Hopi. 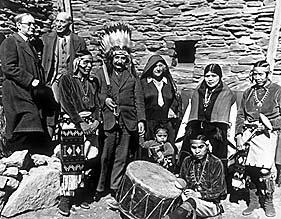 Native Americans in the Southwest have long been tourist attractions and might have understood why Einstein said after his discoveries became well known, “With fame I became more and more stupid.” He explained that people held unrealistic notions of who he was, but felt that it was important to meet the misconceptions with good humor. The Hopi would have understood. There are three women not visible in this photo but unavoidable in any discussion of Einstein’s life. 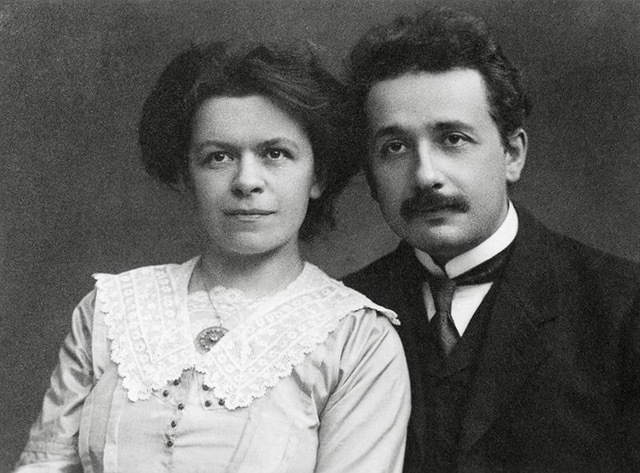 The first is the Serbian physicist Mileva Marić, whom Einstein met in Zurich when she was twenty and he was seventeen. She was the only woman in his class. They fell in love, married, and had a daughter, who disappeared almost without trace. She may have been abandoned, adopted or a victim of scarlet fever. Her name was Lieserl Einstein. As for Mileva, she may have contributed to her husband’s discoveries; in letters he alludes to them as “ours” although the question is unanswerable for lack of evidence. What is clear is that Mileva, one of the very rare women scientists of that time (and there are still many barriers to women in that field) was not able to follow her early successes. Tragically, she became pregnant, the baby died, and a second baby—Lieserl—ended all possibility of serious work in her field. Einstein divorced her in 1919 to marry his cousin, Elsa (the woman with the Hopi) who devoted herself to her husband’s well being. The other woman whose work—El Tovar and Hopi House at Grand Canyon—is present in this photograph although invisible is Mary Colter, the architect of El Tovar and of many of the Harvey House hotels build at this period across the southwest. She lived in St. Paul as a child in the 1890’s when the town boasted a large population of Sioux. After becoming interested in their drawings, Native motifs occurred in the many hotels she designed as one of the very few women architects of the period. 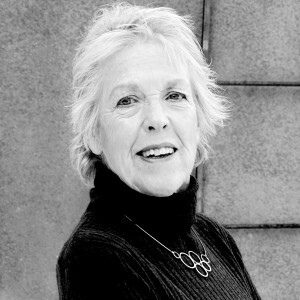 A chain-smoking perfectionist, she left the evidence of her skill and imagination from California to New Mexico. The Harvey Houses were immensely successful, and although many of them were later demolished, a stunning example—renovated exquisitely—still welcomes travelers at the desolate town of Winslow, Arizona. The same gifted entrepreneur is completing work on the massive Harvey House in Albuquerque, to open this summer. Somewhere in these hotels, old photos of the Harvey Girls may be displayed, young women from small Southwestern towns who served as waitresses and slept in dormitories supervised by a matron—one of the first jobs open to young women. And so, as always when we praise famous men, there are women lurking about, often unrecognized and forgotten, but whose impact remains. 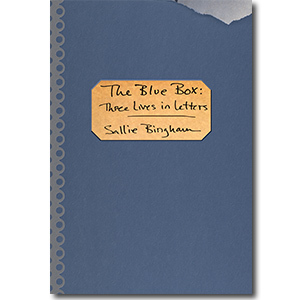 Thanks for writing about this Sallie! Have sent it out to my circle of Earth Walks friends. Very interesting! Have heard rumors for years that Einstein’s wife having much bigger role in discoveries than credited with. Also, his comment about becoming “more & more stupid with fame” certainly rings true. Nice pics also – thanks!! !